The direct way to obtain star distance is to measure the annual parallax. As the Earth orbits around the Sun with a period of one year, star positions show seasonal modulations. 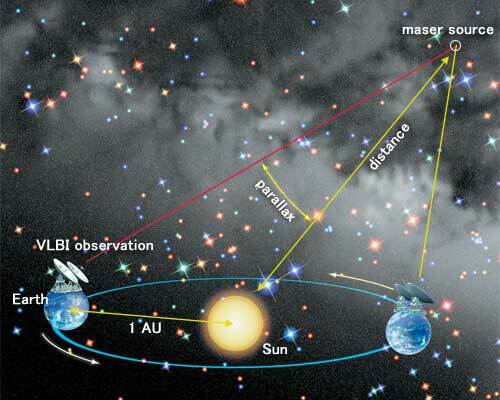 By measuring this annual change of star positions (annual parallax),. one can unambiguously determine the star distance. VERA monitors positions of radio emitting stars for more than a year, and determines annual parallax and distance to them. As the Earth goes around the Sun, star position shows seasonal change, which is called 'annual parallax'.